Lectio is a publisher of academic work in the disciplines of theology, religious studies and spirituality founded to respond to the digital transformation of commercial publishing and print on demand. The site design is clutter free and straightforward to reflect the business model. A color palette of saturated colors keeps the tone serious without being stuffy. Content is written in short paragraphs that can be read at a glance. 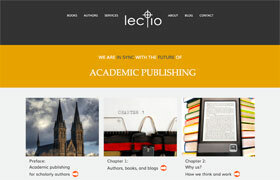 For Lectio’s authors, the site supplements a comprehensive SEO initiative and social media package. Other work includes print collateral and email marketing campaigns.